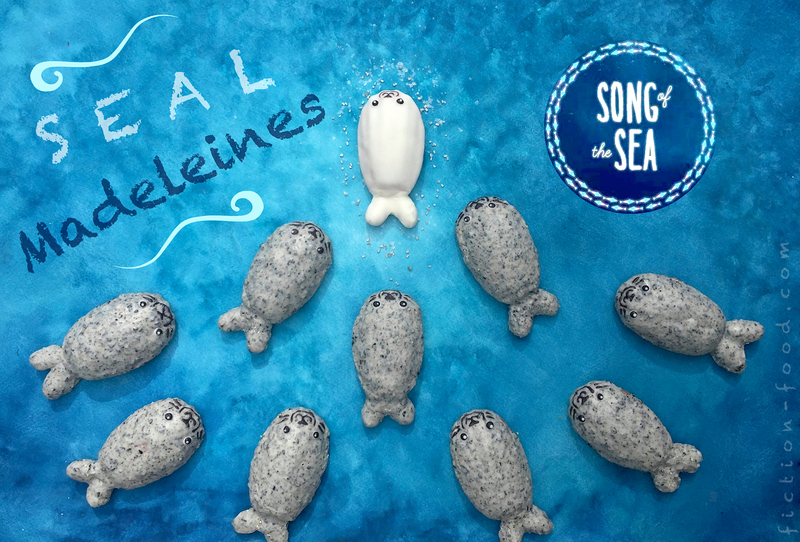 Fiction-Food Café: Seal Madeleines for "Song of the Sea"
Seal Madeleines for "Song of the Sea"
"Song of the Sea"(2014), released in America by GKids, is a gorgeous animated film by Irish illustrator & animator Tomm Moore, co-director of "The Secret of the Kells"(2009), both films being nominated for Academy Awards for Best Animated Feature–because they are incredibly beautiful. 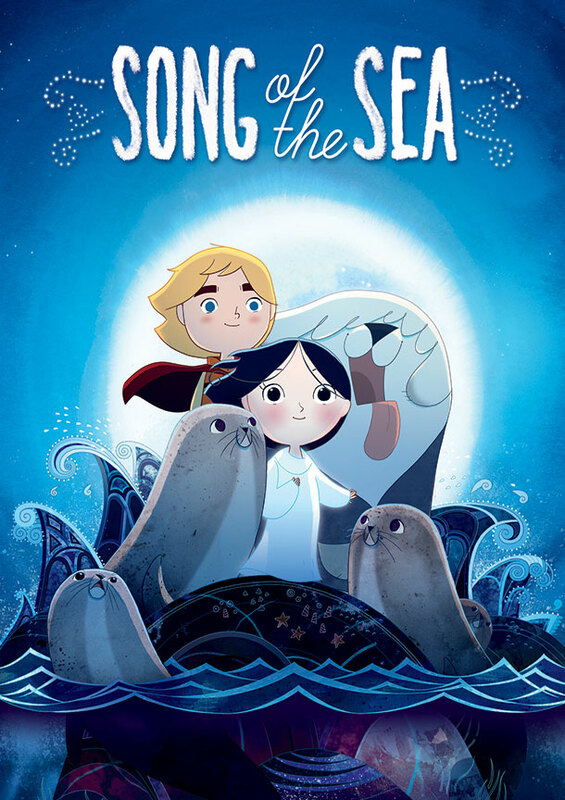 "Song of the Sea" follows the story of a brother, sister, and father, the brother resenting his little sister for the loss of his mother, the sister, voiceless, beginning to discover the inheritance her mother left her, and their father, caught in the sadness of loosing his wife, finally having closure and coming alive again. The movie is immersed in Irish legend, centering on the myth of the selkie; shape shifters that can take the forms of both seals and humans. The animation, music, and storytelling of this film–every aspect, really–is powerful and moving. I highly recommend watching it. 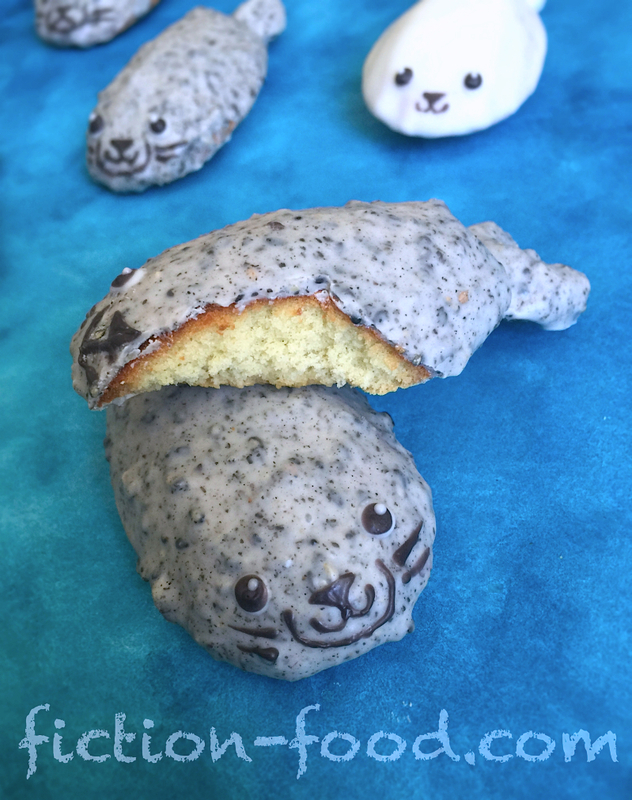 In the film there is a birthday cake and mention of nettle tea, but my mind caught a'hold of the seals and their shape and what could be better for that shape than madeleine cookies? The food creation to celebrate this beautiful film developed from there and I am very pleased with how these little treats turned out. It was also nice to break out my old watercolor paints and paper to create the background for the photographs :). 1. Preheat your oven to 375ºF & butter & flour your madeleine pan. Cut open the tea bag & pour the loose tea into a small pot over medium heat. Add the butter & cook a few minutes beyond when the butter has fully melted, stirring occasionally. Lay your cheese cloth over a bowl & pour the melted butter/tea mixture onto the cloth. Gather up the sides of the cloth & twist/squeeze the butter out into the bowl until you've gotten out all of the butter you can. Sit the butter aside & let cool until needed. Note: The nettle tea inclusion is optional. If you can't find any or simply don't want to use it, only melt 1/4 cup of butter & set it aside until needed near the end of the next step. 2. In a large bowl, beat the eggs, vanilla extract, & salt on high speed until the mixture is light & increases in volume. Continuing to mix, add in the sugar in small increments & beat for about 10 minutes. Sift the flour into the mixture, 1/3 at a time, folding it in gently each time. Pour the butter around the sides of the batter & gently fold that in as well. Spoon the batter into the molds & bake for about 12-14 minutes, or until golden brown around the edges & the centers spring back when lightly pressed on. Remove from the pan & let cool on the wire rack. Position the whole almonds behind each madeleine so they resemble a seal tail (like a fish tail). 3. Break off 1/3 of the Candiquick & set it aside. Melt the rest in the microwave & stir (follow the package instructions). A few tablespoons at a time, grind the sesame seeds with your mortar & pestle or food processor (I used an m & p so I'm not sure how well the food processor will work, maybe better!). Add the ground sesame to the candy melt & stir until fully combined. Add more ground sesame until you get a nice medium gray (at least 1/2 cup of seeds, possibly more). Note: If you can't find black sesame seeds (try an Asian market) or don't want to use them, simply use grey candy melts or black candy melts mixed with this white Candiquick. The sesame seed & chocolate combination really is good though! 4. Move the madeleines just a titch away from their almonds & spoon the sesame chocolate over the almond "tails", all except the ones you want to make into white seals. Put the madeleines back into position with their tails & spoon the sesame melt over each madeleine (again, except the ones you'll be making into white seals). Let harden & add a little more melt between the madeleines & almond tails if needed. 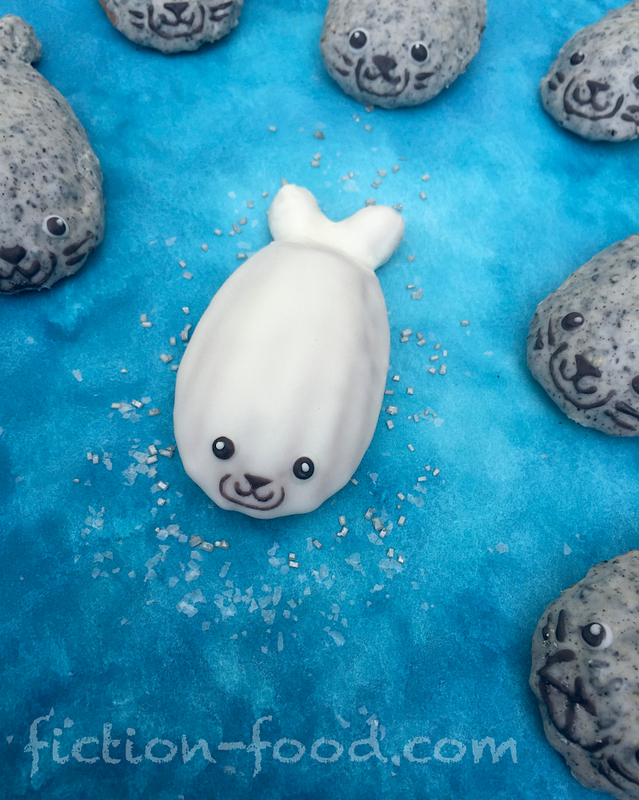 Melt the white Candiquick that you set aside & coat the remaining almond tails & madeleines to become your little white selkie seals, leaving just a little bit of white chocolate for later. 5. Once all of the chocolate has hardened, use a spatula/slotted turner to scrape away any hanging chocolate from under the cooling rack & then very gently pry the seals off of the rack & place onto a tray or parchment paper. If any of the tails break off while taking them off of the rack, simply reattach them with a little bit of appropriately colored chocolate. Use what is left of the white chocolate & dab little eye whites onto each seal. Next, melt the black candy melts & use a clean toothpick to dab pupils onto the eye whites. Continue using the black melt to carefully draw a little triangle nose & mouth onto each seal (I made mostly smiling mouths, like little "w"s, but you can also make an upside-down "V" instead). Next, draw a wide "U" around & under the mouth area & add a couple little whiskers on either side (I left the whiskers off of the white seals). If you need to correct any mistakes, you can use a toothpick to carefully scrape away the black melt. Lastly, make the eye highlights with a tiny dot of white on each pupil. Serve with nettle tea & enjoy! These are so adorable! I make madeleines a lot, and I'm always looking for new varieties to try. I'm definitely buying the movie now. I'd heard good things about it but didn't know it was made by the Secret of Kells team. It looks amazing! Oh, I'm so glad you're gonna get this movie! 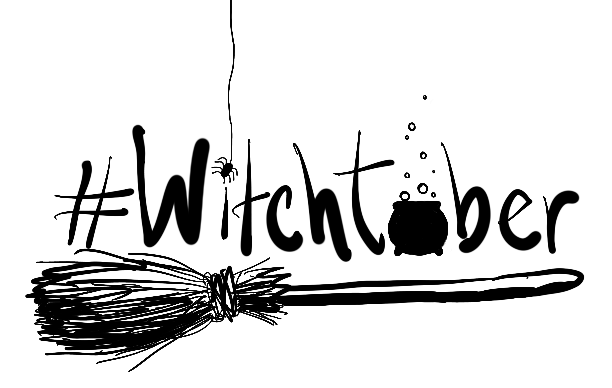 It really is lovely, especially if you liked Secret of the Kells, you'll like this. Thank you for this recipe!! 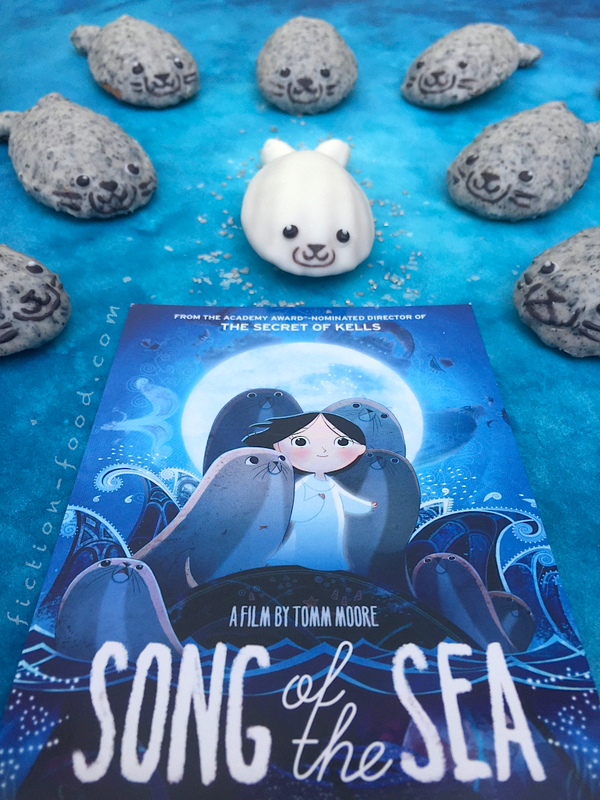 I loved Song of the Sea, I can't wait to make these! So adorable!! These look great! We watched the movie for the first time just recently. 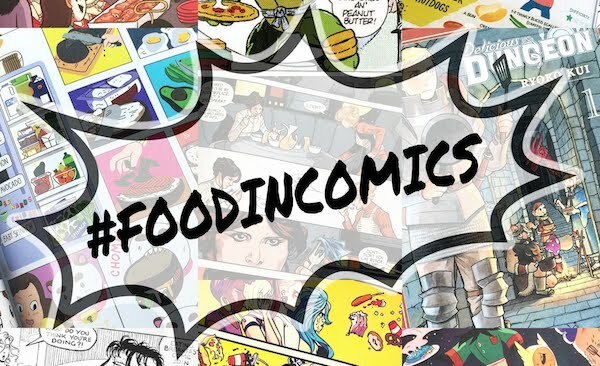 I found your blog looking for Avatar recipes and have been coming back ever since. I really enjoyed see what you come up with.